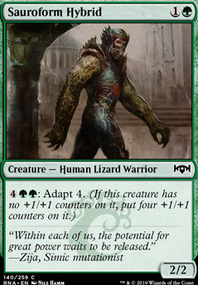 Undergrowth — Rhizome Lurcher enters the battlefield with a number of +1/+1 counters on it equal to the number of creature cars in your graveyard. Hi, somewhat of a interesting deck, My primary suggestion is to considerably lower or take out a bunch of the 1x's. The ones in which you need most should always be put at a 4x or at least a 3x. 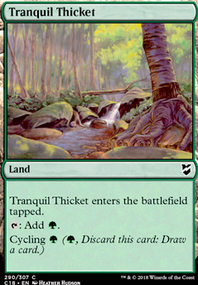 I'd start off with something like this in a way to revolve around Undergrowth and Vraska. Someone else can help out and build upon this idea for later if they like or improve upon it for I don't often play Golgari. Hopefully it helps out a bit. 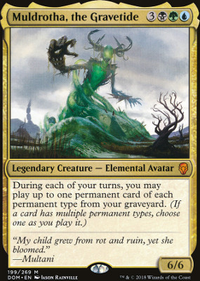 Rhizome Lurcher - I would compare this guy with Molderhulk and the Hulk can come at least one turn earlier and he gives you land from the graveyard. My experience with Hulk: Early threat but without any evasion or trample which the Lurcher haven't as well, it will die horribly or gets blocked. So I would prefer Hulk over Lurcher even it will get bigger. Necrotic Wound - At the beginning where I start to build the deck, I got a playset Assassin's Trophy, three Necrotic Wound and three Ravenous Chupacabra as the removal pack. 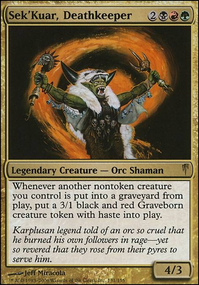 While the meta, lgs-wise, switches to a drake-heavy gameday, I change the package to Kraul Harpooner and Cast Down. Cast Down don't require a full graveyard and while there aren't many copies of Niv Mizzet around it wasn't a bad addition, Kraul Harpooner needs one creature in the yard to kill the drakes while Trophy has the drawback "ramping the opponent". Maybe since the added Seekers' Squire which gives more tools to fill the graveyard, I could change the Removal pack back to Necrotic Wound. My last thought is that I could change a little bit more to add another Journey to Eternity Flip as well as a one-off Lotleth Giant as a payoff to the filled grave. I guess that I have to cut the Creeping Chill and the Maindeck Ritual of Soot to be more resilient. Or should I add Blue (Chemister's Insight, Sinister Sabotage, Mission Briefing) or Red (Fight with Fire, Experimental Frenzy, Risk Factor)... Thoughts? How about Rhizome Lurcher? Seems like it would have tons of value here. Also the card you have for your main pic. Necrotic Wound slides in like butter. I'd say play the cards you love. Pauper is a format where you can do much about anything, new decks come and go constantly (unlike formats like modern where there are certain decks that don't really change tier or competitive consistency). 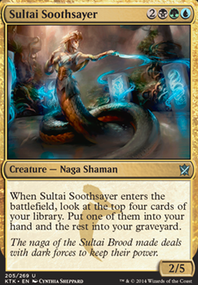 There's lots of ways to go with a GY deck in pauper, and GRN brings tons of possibilities with Rhizome Lurcher or possibly Hired Poisoner. Screw most of the suggestions on here, follow your heart. I've been dwelling on my previous comment. Forget the Wurm, Rise from the Grave can be used to great effect when returning Doom Whisperer (makes it a zombie) or Lotleth Giant (includes Lotleth Giant in the undergrowth count) from the graveyard. Also, I'm really into splashing green to include Assassin's Trophy, and Rhizome Lurcher. With Whisper, Blood Liturgist, Rhizome Lurcher can also be used to great effect. 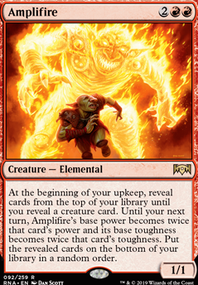 Activate Whisper, Blood Liturgist, sacrifice it and another creature, then return Rhizome Lurcher from the graveyard. Rhizome Lurcher will enter with +3/+3, plus +1/+1 for each other thing in the graveyard, then can be buffed by Death Baron. I think it can be more effective than Bone Dragon for the reasons stated above! Just my idea, would love to hear your thoughts.